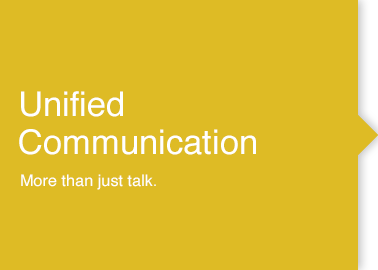 Unified communications (UC) is the integration of real-time communication services such as instant messaging (chat), presence information, telephony (including IP telephony), video conferencing, call control and speech recognition with non real-time communication services such as unified messaging (integrated voicemail, email, SMS and fax) that enable more effective communication and collaboration. Unified communications solutions help businesses, small and large alike, to streamline information delivery and ensure ease of use. Human delays are also minimized or eliminated, resulting in better, faster interaction and service-delivery for the customer, and cost savings for the business. Unified communications also allows for easier, more direct collaboration between co-workers and with suppliers and clients, even if they are not physically on the same site— allowing for possible reductions in business travel. Call Center Management solutions can instantly provide employees with resources to deliver a higher level of customer service. By integrating conferencing and collaboration tools into a unified communications system — via web, audio, video —organizations can achieve instant access to people, documents and resources regardless of location. Unified messaging integrates different forms of communication (email, SMS, FAX, voice mail, video messaging and more) into a single interface, accessible from a variety of devices. VoIP (Voice over Internet Protocol) is a way to carry phone calls over an IP data network, whether on the internet or on your own internal network.